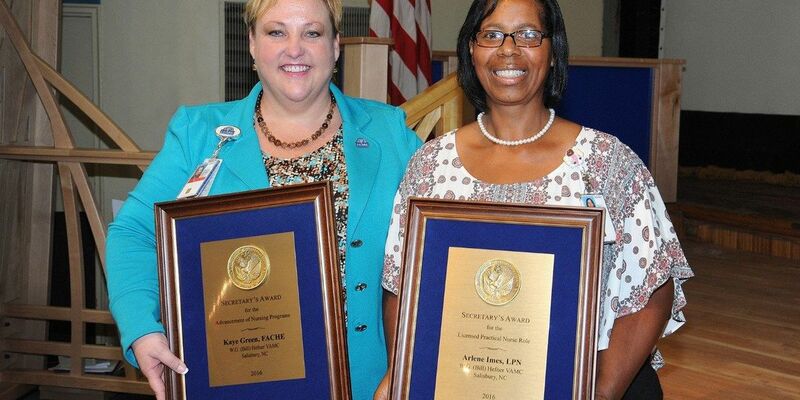 SALISBURY, NC (WBTV) - Two Salisbury VA Health Care System (HCS) employees were recently recognized nationally for their "exemplary service and dedication to Veteran health care." Every year, the Secretary of Veterans Affairs presents "Excellence in Nursing" awards to recognize the outstanding work of VA staff that play a vital role in providing and supporting nursing practice and care to Veterans, according to a news release from the VA Medical Center. Arlene Imes, a Licensed Practical Nurse, and Salisbury VA Medical Center Director Kaye Green, were honored for their compassion, care, contributions at the national level, support for expanded nursing responsibilities, and improvements in nursing practice through education and training. Imes received the Secretary of Veterans Affairs Award for Excellence in Nursing. Imes is passionate about her work at the Salisbury VA. Imes is a Licensed Practical Nurse (LPN) with 28 years of experience in health care. She is highly regarded by her peers, who say she always goes the extra mile to assist those who need care. She was instrumental in helping the LPN Telehealth Clinical Technicians develop materials that will provide them with the opportunity for demonstration of competency in their respective skill sets. Throughout her career, Imes has received numerous awards in recognition and appreciation for her personal commitment and dedication to patients. Through her participation in the Leadership Development Programs, Imes' learning project focused on identifying how Veterans receive information and how they prefer to receive information according to their era of service. The knowledge and insights derived from Imes' project are now used by staff to best provide Veterans with information in a variety of methods, adapted to their individual preferences. Green was recognized with the Secretary of Veterans Affairs Award for the Advancement of Nursing Programs by a Medical Center or Health Systems Director. During Green's four years as Medical Center Director, she has "displayed unwavering support for nursing programs and more importantly, nursing staff." Green's ongoing leadership has helped create an exceptional nursing service, as demonstrated by establishment of a nursing program that is defined by professional excellence, guided by the precepts of shared governance, evidence based practice, and VA's "I CARE" values. Green said, "Our nurses at Salisbury VA are deeply committed and passionate about ensuring that Veterans receive the best health care and make a profound difference in their lives. You can't have a world class health care system without world class nurses." According to the news release, Green not only committed clinical, financial and human resources, but spent countless hours of her time meeting with nursing leadership and nurses, as well as Veterans and their families. Green recognized the need to invest in the education of the nursing staff and commissioned a facility education department, with the goal of preparing professional nursing staff to succeed in their roles and to equip them to meet the future challenges of health care. It is through Green's commitment to nursing education that the Salisbury VA HCS is recognized for increasingly healthy, evidence-based nursing practice. For further information about VA services visit www.explore.va.gov or on Facebook at www.facebook.com/VASalisbury.